My analysis of last week (America Attacked During Obama Health Care Debate by British NHS Army) illustrated many aspects of why the NHS has become a funding black hole that fails to deliver competent healthcare despite the fact that under new Labour funding of which has tripled to £120 billion, whilst at the same time productivity has fallen by 5% over the last 10 years. Let me repeat that, the funding for the NHS has TRIPLED whilst productivity has FALLEN by about 5%! which illustrates what is meant by a funding black hole. However that is the tip ice-berg where the NHS is concerned as my ongoing analysis has illustrated over the past 3 years that there now exists a huge gap between the healthcare provision for affluent areas and deprived areas of the country that has resulted in a gap of as much as 20 years in life-expectancy between a few miles distance which is more commonly known as the postcode lottery. Even the Lib Dem leader, Nick Clegg has spoken out at the huge disparity in health services in his home city, Sheffield. 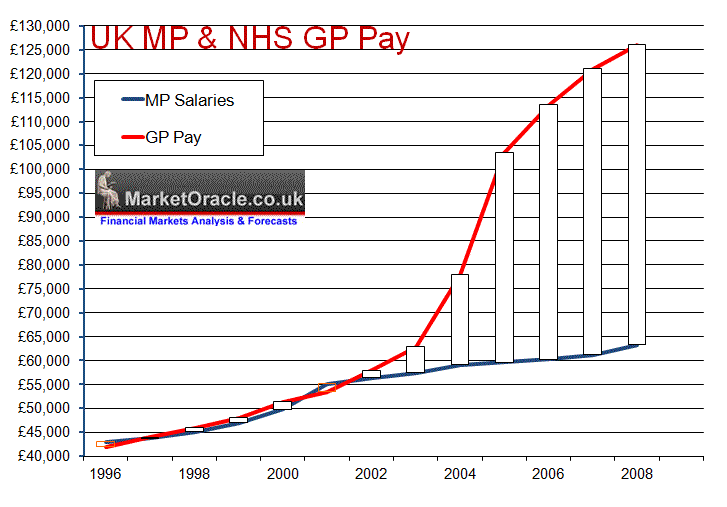 What has happened with GP Pay illustrates more than anything else of where the money has disappeared to. When Labour came to power in 1997 average MP pay was £43,722 against average NHS GP pay of £44,000, so both were inline with one another at that time. However as the above graph clearly illustrates in 2003 something started to go seriously wrong with GP Pay which took off into the stratosphere as GP's decided to award themselves pay hikes of more than 30% per annum at tax payers expense that has lifted average GP pay to £126,000 per annum against £64,000 for MP's. The country is suffering from a series of public spending black holes from the £800 billion and growing public sector pensions deficit to the NHS that wastes as much as 90p in ever extra £1 spent on it. The governments answer so far has been to print money and raise taxes on the rich to 50%, though basic rate tax payers should not delude themselves as come post election 2010 the basic rate tax will be heading higher towards a target of 30%, and not forgetting the semi-stealth tax of 23.8% of NI, which already brings the real tax rate for ordinary tax payers to 43.8%. The Labour party has been on a debt fuelled spending binge that as a consequence of the bankruptcy of the financial sector has gone parabolic during the last 18 months which is destined to lift total tax payer liabilities from £1.75 trillion at the end of 2007 to £3.9 trillion by the end of 2010. Instead of meeting the budgetary crisis head on, both major political parties continue to lie to the electorate when they both commit to real terms growth of NHS spending and other public services, despite the budget crisis demanding across the board cuts of as much as 15%! Incompetence, greed and waste are the operate words, NOT value for money or putting patients first as illustrated by an opinion poll amongst 156,000 NHS staff that found that patient care is not a top priority for the NHS. It is no wonder that patients in their hundreds of thousands are seeking private health screening and GP services for if the truth of the matter were told, if patients left themselves to the NHS then they would in many cases be dead before the NHS got around to calling them in for their consultations from the waiting lists. Why wait as long as 18 months for an NHS screening appointment when you can have one next week for £150? That is if the patient makes it past the 2 minute GP diagnoses sessions that are akin to GP's swiping patients in and out of their doors as credit cards to bank profits on, so much for the objection that a privatised NHS would result in profits for private companies. NHS Wasting Tens of Billions Every Year. The approximate amount of extra real terms spending per year is put at £47 billion, of which 50% has gone on pay rises and of the remaining, 20% on a series of wasted initiatives and projects such as the billions spent on a computer system that still does not work. This means that the more money that has been spent on the NHS the less productive it has become as staff (primarily doctors) lose the incentive to work more and hence cut back hours. After all if your pay was tripled for the same work, would you opt to work more or less ? Privatise the NHS and Save Britain. Margaret Thatchers government that inherited an economic crisis from the last Labour government was given the green light by the British electorate to abandon the consensus that had existed since world war 2 of a creeping socialist bureaucratic state and set about systematically dismantling inefficient loss making stat run entities in favour of free market competition that aimed to deliver choice as well as efficiency. Similarly today's Conservative party on winning the next election has in its means to turn the current economic crisis into a golden opportunity to embark up on a similar radical departure of the last 17 years trend of expanding socialism that had manifested itself in the huge growth of the bloated public sector over the past 12 years which was preceded by 5 years of the the weak dithering Major government. It may now be lost in the mists of time but there was a missed opportunity during the Thatcher years with regards to real market orientated reforms of the NHS with a view to putting the patient first, unfortunately of the two remaining objectives for reform during Margaret Thatcher's third term of either the NHS or local government taxation, Margaret Thatcher sought to reform local government taxation by means of the community charge which became to be known as the poll tax and resulted in the downfall of her premiership. Had she chosen reform of the NHS then how things may have turned out differently for both her premiership and for the healthcare of Britain. The wholesale privatisation of the the NHS could yield an estimated £250 - £300 billion, as well as the positive impact of real competition between hospitals and between GP practices rather than the old boys network that prevents GP's from competing against one another that exists today. This would put the incompetent out of business and push capital and revenues towards the more competent practices resulting in huge cost savings to the tax payer of up to 30% that ARE necessary given the budgetary crisis. A privatised National Universal Healthcare system could function by means of every person in Britain having a National Health Debit Card that would enable payment cover for all accidents and major illnesses, as well as annual checkups, where the patient has the choice of where to PURCHASE healthcare from ANY GP or hospital of their choosing at anytime, much as consumers today using debit cards to purchase electrical goods of their choice from any outlet of their choosing. Thus the current divide between affluent wards and deprived wards would disappear as the MONEY WOULD WALK WITH THE PATIENTS, as patients would only spend money in the competent well run institutions rather than the current system of healthcare which has NO INCENTIVE TO PUT THE PATIENT FIRST, NONE! Privatisation of the NHS, rather than a vote loser, I believe could be a major vote winner for the Conservatives as it would fire the imagination of the British electorate that finally they would be getting a healthcare system that actually pulls out all the stops to put them first as health delivery institutions finally have a monetary incentive to do so, which means quick, efficient and comprehensive treatment. Rather that the current system of who makes the loudest noise i.e. complains the most, gets more favourable treatment whilst the quite are left to whither and die due to systemic neglect. Not only would the patients win but also healthcare workers would benefit both psychologically from being part of a functioning health care system and monetarily incentivised to perform better and hence have a far more enjoyable career than the current one in an NHS that they KNOW IS SYSTEMICALLY FAILING PATIENTS. Do the Conservatives Actually have the Bottle to Say What They Believe ? That is the big question as David Cameron in public anyway has repeatedly and forcefully denounced any of his colleagues that step out of line and criticise the NHS is any form. So basically he is saying to his many colleagues that they need keep smiling and lie to the electorate on their views of the NHS so as to win votes at the next election. Perhaps the British electorate should elect the party at the next election that they believe to be the most truthful to their views in which case Both Brown and Cameron come across as Pinocchio's! Especially as we watched MP's from both parties squirm and lie to the electorate over the expenses scandal. The only reason the NHS has become a funding black hole is because of the internal market and encouraging business management in the NHS. It has been semi-privatisation and 'Americanisation' of the NHS that has been its downfall. Also a lot of the funding given to the NHS was to rebuild its chronically underfunded (thanks to the thatcher years) hospitals and clinics. Look at the bigger picture. Americanisation of the NHS ? Where is there patient choice in the NHS ? NOWHERE ! It is run like a soviet style institution, where there is ONLY one supplier of healthcare to over 90% of the population. Imagine if there were only ONE state run supermarket, yeh the shelves would be empty and long qeues at the checkout ! Even the russians eventually abandoned that model of healthcare! leave our NHS alone. We in Britain have no desire to be like america. The value provided by the NHS ensure all get health care in this county no matter what there problems are and can not be rejected. The many protect the few and it is fantastic. Maggie Thatcher is seen by most as the most evil vile creature ever to walk the earth. She only stayed in so long by forcing already finacially crippled familys from vating by taxing it. Americas social policys are discusting long live Britain, long live a socialist strong Europe to showw the way to the world. The NHS is bankrupting britain. The NHS official statistics are phony. Look at mid staffs hospital that killed 400 of its patients but rated ITSELF as one of the best hospitals in England! In reality as the damning independant inquiry revealed it is by far the worst ! a few days later another 20 so called best hospitals were also found to be basically crap ! The whole NHS operates as such without any REAL accountability.